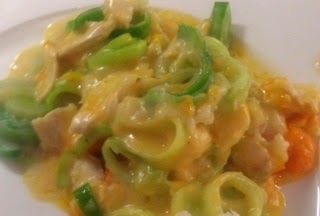 This weekend is the Monaco Grand Prix in Monte Carlo and so I've made a recipe called Chicken Monte Carlo. I found it online but couldn't find any explanation of why the dish has that name so I don't know if it has anything to do with Monte Carlo itself but the name alone means it fits with my Formula 1 Foods challenge! I found several recipes for Chicken Monte Carlo online which were all slightly different and as I wasn't sure which to use, I picked different elements of each. They all seemed to use broccoli which I always have in the house so was very surprised to find when I started cooking that I had run out! I decided to make the dish anyway and use leeks instead so this ended up being a fairly random recipe but it did actually taste very nice. This recipe is the closest one to how I made it but I was surprised at the amount of mayonnaise it called for and used far less, and I didn't use any stuffing. I had to use leeks instead of broccoli and Red Leicester cheese instead of Cheddar! I served this with mashed potato and some more veg; it tasted nice even though it was quite different from the original recipe - but as I was about to go on holiday and made this just before I went away, so I could post the recipe this weekend, I didn't have any time to do anything else! I'm sharing this with Formula 1 Foods, the blog challenge I started in honour of the F1 Grand Prix.